About an hour’s drive north of Catania is a small town considered one of the jewels of Sicily. Perched on a cliff at 200 meters high, Taormina offers an incredible view of the sea and the Etna volcano. 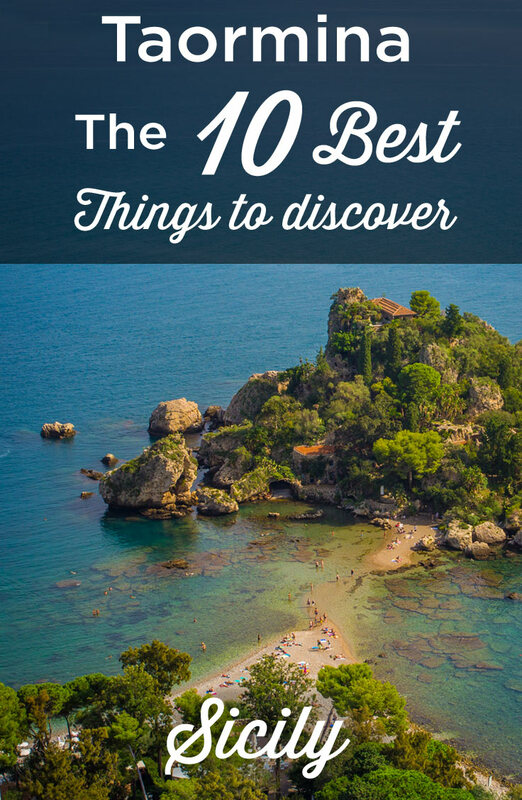 In this guide, I will first present you the 10 best things to do in Taormina. Yep, you will know everything you need to visit the must-see attractions of the city and its surroundings! And if you are wondering where to stay in Taormina, I have selected for you the best hotels depending on your budget. 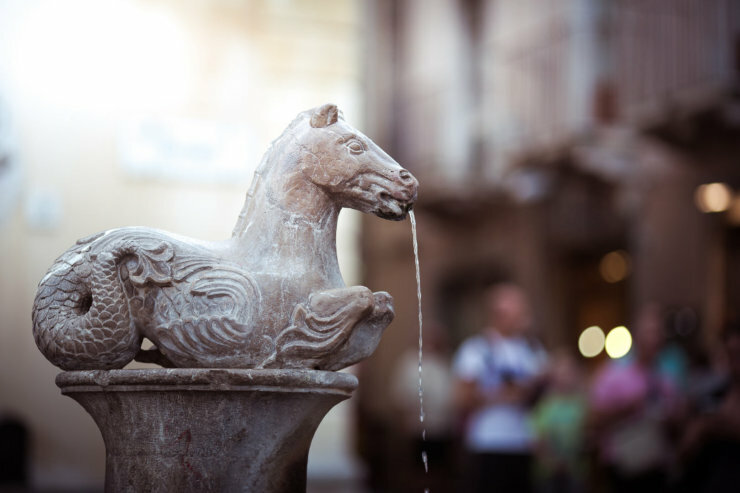 So, what are the best points of interest in Taormina? Visit Taormina: the 10 Must-See attractions! How many days in Taormina? Taormina: what to do in 1 day? Where to stay in Taormina ? Where to eat in Taormina ? How to go to Taormina ? The first thing to know before visiting Taormina is that the city center is a pedestrian only area. It’s really a great thing, but also something important to know if you arrive by car, as you will have to leave it at one of the 2 paid car parks located at the extremities of the city. In high season, needless to say it can quickly become very complicated! So if you spend at least a night in Taormina, it’s very important to choose an accommodation with private parking. Alternatively, you can also park in the lower part of the city and take a bus that will take you directly to the old town. It’s a backup solution as it can be really crowded in summer. Now you know this, let’s discover the city of Taormina! The Corso Umberto is THE main street that crosses the whole center of Taormina. Flanked on both sides by a succession of luxury boutiques, clothes, jewellery, and souvenirs, it makes you understand why Taormina’s nickname is “the Sicilian Saint Tropez”. You will also find many grocery stores, bakeries, cafés and restaurants, and you will certainly hesitate where to go for your lunch or dinner. On your way, you willl find the Piazza IX Aprile, one of the best viewpoint in Taormina, with a huge panoramic terrace overlooking the bay below and the Etna. It is the perfect place to take beautiful photos, especially at sunset. Enjoy its typical atmosphere with musicians, acrobats and painters. You will also see a small church that adds to the charm of this small square, the Chiesa de San Giuseppe. Its baroque facade is very beautiful, but the interior is quite classic. Piazza IX Aprile, in Taormina. One of the best viewpoint! If you wish to visit a typical Sicilian church, choose the cathedral of Taormina (also name Duomo di Taormina in Italian). Located at the end of the Corso Umberto or at the beginning, depending on where you entered the city, its medieval facade and baroque door are its main attractions. The interior is worth a visit, and it also offers another appreciable thing in summer: It remains quite cool even if it’s hot outside! 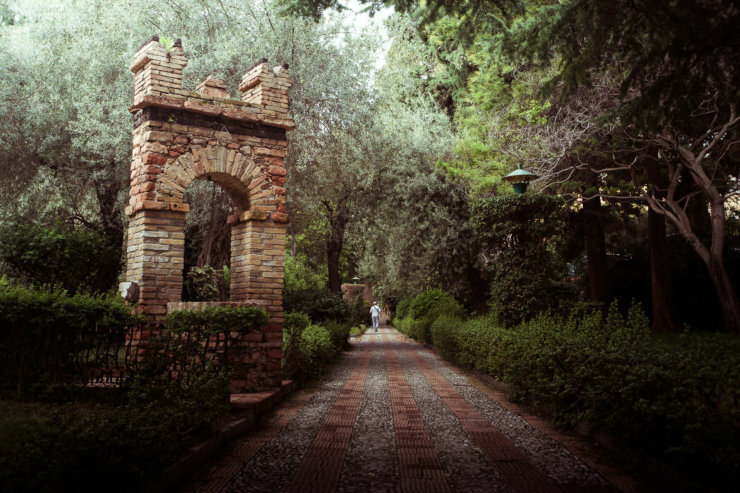 To get away from the crowds, don’t hesitate to visit the Villa Comunale, which houses a large public garden. This villa belonged to a rich Englishwoman, passionate about birds and who decided to build many structures such as feeders and nesting boxes. The view of the bay is magnificent and it is the ideal place to enjoy a picnic in the shade of the vegetation. If you plan to buy sandwiches for lunch, it’s definately the best place in town to enjoy them! 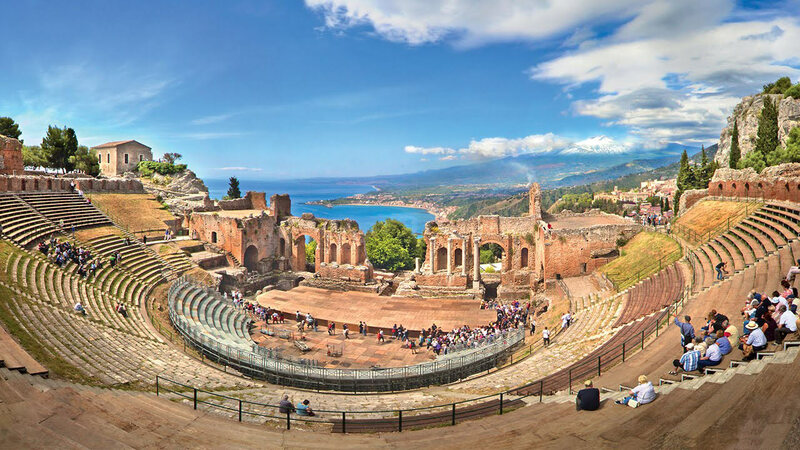 The most famous monument of Taormina remains its Greek theatre. It dates from the 3rd century BC and is remarkably well preserved. It can accommodate more than 5,000 people and is home to theatrical performances and concerts. An important thing to know is that if you visit it a day of concert, you will see a huge stage in the middle, which removes a bit of magic from the place. Admission for this ancient theatre is 10€, which is a bit expensive, especially considering that the visit is done quickly without any explanatory panels or brochures. Only about 30 minutes to take a few pictures but again, it is mainly for the view that we go there. Despite the prize, the Greek theatre remains an absolute must see in Taormina. For those who still have some energy left, go to the via Circumvallazione. 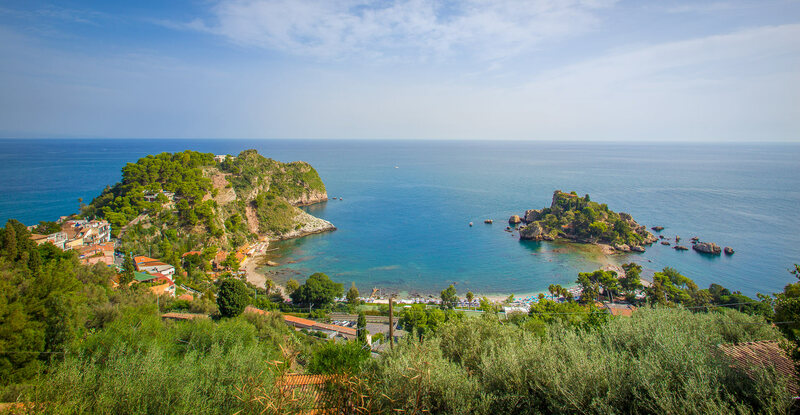 From there, a staircase of more than 300 steps and without any shade (bring a bottle of water), will bring you to the heights of Taormina in about twenty minutes on foot. You will enjoy a bird’s eye view of the city and the Greek theatre. Also worth seeing: the sanctuary of Madonna della Rocca, a small chapel partially dug in the rock. You can’t miss it, it’s the little island at the bottom of Taormina, the one you can see on every postcards! You can reach Isola Bella on foot in half an hour from the top of Taormina (going back will be harder on your legs!) or by car (good luck to find a parking space nearby!). This cove is simply stunning, with its pebble beach and crystal clear waters. On the spot, there are many activities available to you: snorkeling, diving, boat ride, jet ski rental or simply relaxing! Located 5km from Taormina, the small village of Castelmola is worth a visit for its ruined medieval castle and its charming little streets. In the village and from the castle, there are some of the best sightseeing points on the valley below and on Etna. Don’t forget to taste the almond wine, a speciality of the village. Located 50 minutes drive from Taormina, this site is a geological curiosity. The Alcantara Gorge are more than 25 meters high and only 2 to 4 meters wide. 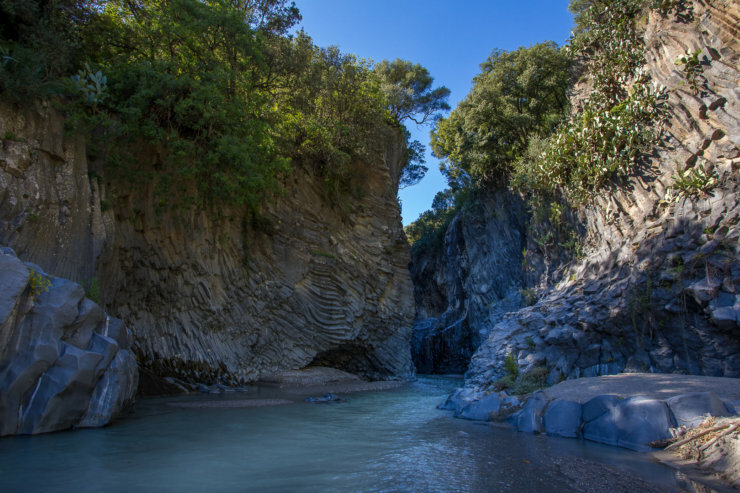 The particularity of this narrow canyon lies in the formation of its walls, which are the result of several lava flows coming from the northern slope of Etna. This volcanic material cooled down in contact with the waters of the river and drew original shapes. This place is not necessarily the best for swimming, because the water is very cold! There are several ways to reach the gorge. The first one is by the main tourist spot, there is a big sign at the entrance and a large parking lot that will allow you to park your car easily. You will then use an elevator to go down to the gorges and will be have a guided tour. The minimum entrance fee is 15€. The 2nd possibility (which I advise you) is to continue a little bit further along the road, where you will find a small hut on the right side. You can buy Alcantara Gorges access ticket there for only 2€ per person. At this price you will use the municipal staircase to go down the gorges, but can enjoy the place the same way for a much lower price! Starting from Taormina, many tours operators offer one-day Etna excursions. They will take you to the foot of the volcano, provide a guide and equipment, and organize the 4×4 ascent to the crater. Probably the safest option to visit the Etna! You can of course go there by yourself, with your car. It’s about an hour’s drive from Taormina. If you want to do go to Etna during your stay in Taormina, I highly recommend you to book your trip with Getyourguide. It’s simple, they have the best English speaking guides! And the price is very good too. The time you spend in town will depend on what you want to visit, but I recommend spending at least 2 days in Taormina. In my opinion, this is the minimum for enjoying the must-see attractions of the region. Here is a short itinerary for one day in Taormina, so you will not miss any major attractions of the city! Visit of the old town in the morning and climb to the Madonna della Rocca sanctuary to enjoy the view. 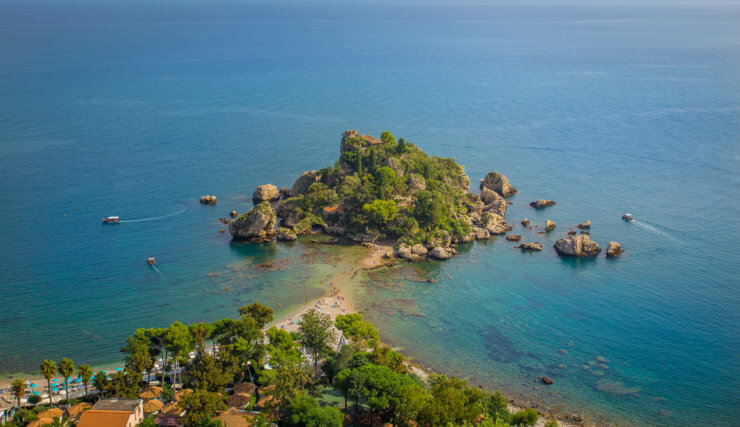 Swimming at Isola Bella beach in the afternoon and visit of the Greek theatre of Taormina. I recommend that you visit the Greek theatre at the end of the day, that’s when the light is most beautiful! But if you’re in a hurry, there’s nothing to stop you from visiting it in the early afternoon and then going down to the beach (and so you don’t have to go back up to Taormina). Start with an excursion to the village of Castelmola, which offers a magnificent 360-degree view of the entire region. A must-see place near Taormina! Then head to the Alcantara Gorges for a refreshing moment in the shade of its walls made of columnar jointed volcanics with improbable forms. If you have 3 days in Taormina, I strongly recommend you to go on a trip to Etna, it is an unforgettable moment! Beach lovers will certainly also want to go back to Isola Bella. If you like snorkeling, you can go for a walk in the Grotta Azzura of Isola Bella. Just be careful with the boats, because there are organized tours to this place. Hostel Taormina: Youth hostel located in the heart of Taormina. Bed in dormitory from 22.50€. Free Wifi. Breakfast not included. A little extra: a large panoramic terrace. Casa La via del Mare: Located halfway between the beach and the historic city centre of Taormina. Modern and bright room from 80€ per night. Breakfast included. Free Wifi. The plus: Free parking! Medea Residence : Located close to the main street of Taormina. Apartment with kitchen, modern and bright. very quiet. Outdoor swimming pool. Free Wifi. Private paid parking: 10€ per day. Minimum of 3 nights rental for 210€ = 70€ per night. 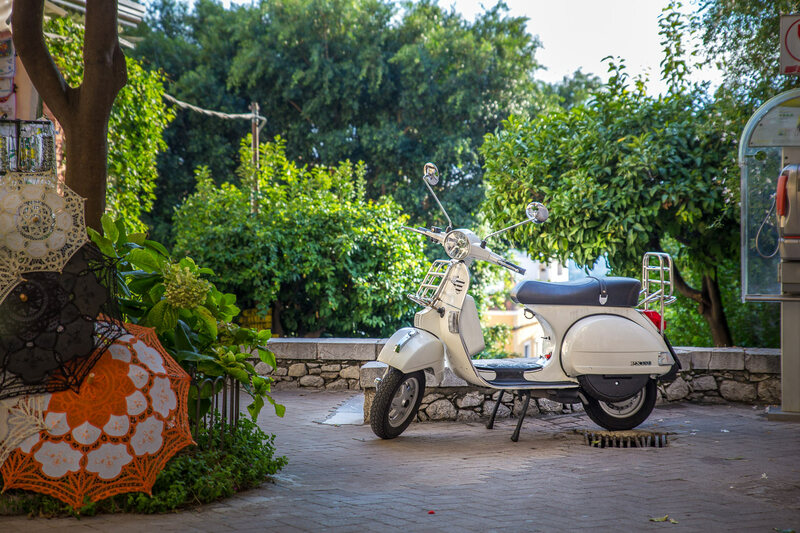 Hôtel Villa Diodoro: Located at 5 minutes on foot from the historical center. Large and bright double room starting at 190€ per night, breakfast included. What we loved: the free private parking, the location, the swimming pool, the outstanding view, the very helpful staff. It’s the best choice for a luxury stay in Taormina! In Taormina, hotels nights can quickly become quite expensive. So a good solution can be to use Airbnb to rent a room or a full appartment! With Voyage Tips, you can benefit from a 25€ discount on your first booking. If you already have an account, don’t hesitate to create a new one to get the 25 euros. 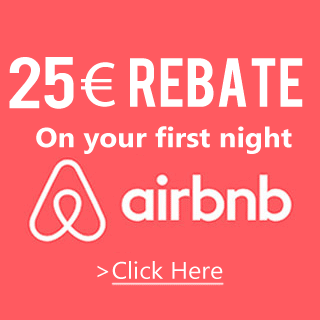 This rebate will then be automatically applied to your first booking above 69 euros. Taormina without a Vespa? impossible! Tiramisu Trattoria: Nice decoration and friendly welcome with a quiet terrace. Excellent cuisine based on fresh produce. Copious dishes for a reasonable price. Not to be missed: tiramisu, the house specialty. Reservation recommended. Trattoria Don Ciccio : Located in a quiet street. Very good cooking with quality products. The pasta is succulent. A Prosecco cup and a small bruschetta are offered in case you need to wait. Reservation recommended. Pizzeria Villa Zucaro: As the name suggest, you go there if you want to have a good pizza! Impressive choice, delicious, copious and original pizzas. Choose the terrace over the noisy interior. Attractive and thoughtful waiters. To get to Taormina, you must first take the plane to Catania. By bus: One bus every hour from Monday to Saturday and 2 on Sunday; 1h30 by road; 5.60€. By train: The train is not recommended because the train station is located 2km downhill from Taormina and you will then have to take a bus to get to the city. Check flights ticket prices now with our flight comparator: This is the solution to find the best price for your flight to Sicily!